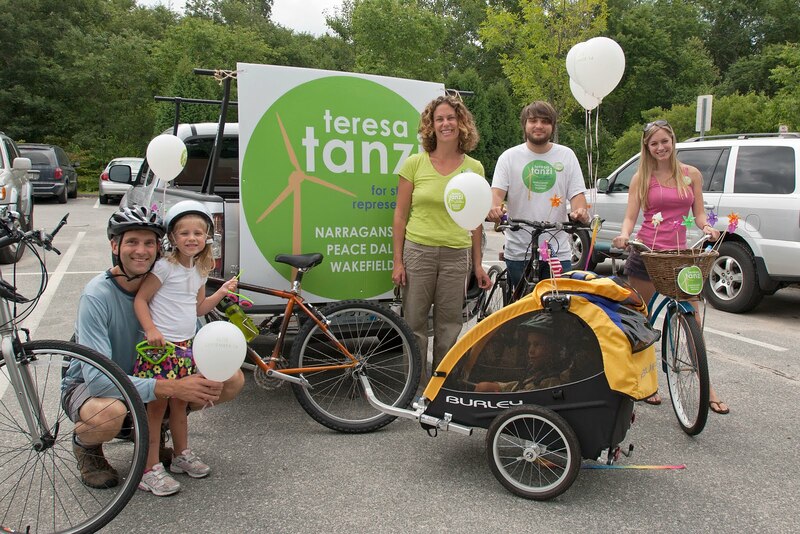 Teresa Tanzi: Two Wheels For Tanzi, Take Two! Two Wheels For Tanzi, Take Two! 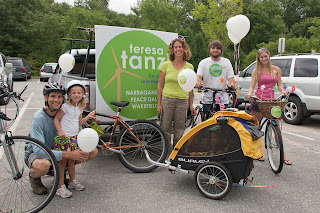 This Sunday, the Teresa Tanzi for State Representative campaign celebrated the 30 day mark until the primary election by kicking off our carbon-neutral canvassing week with our second Two Wheels for Tanzi event. 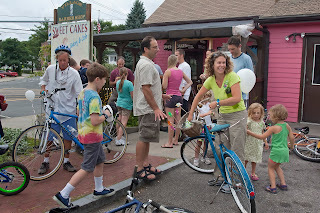 Supporters and friends rode their bikes and motorcycles to Sweet Cakes Bakery in Peace Dale. 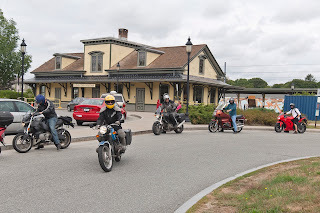 A large group of bicycles, led by Teresa, rode the 5 miles on the South County Bike Path from Kingston train station to the bakery, while a fleet of motorcycles, led by Teresa's husband Eric Buchbaum, took a more winding path to the meeting spot. 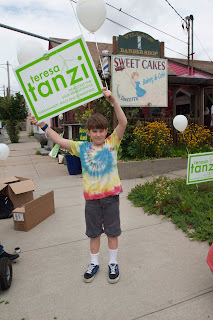 Once gathered at Sweet Cakes, the Tanzi supporters all enjoyed some delicious iced coffee and cupcakes while tackling the most important task of the campaign - getting the word out to the community. Some of our younger supporters enthusiastically waved signs and balloons at passing cars while many others looked through the district voter file to send post cards about the campaign to friends in the district. We mailed over 30 post cards while we were there! The event also kicked off our special carbon neutral canvassing week, during which the campaign will be riding bicycles across the district as we continue to knock on doors and talk to voters about theirs ideas and concerns. With less than 30 days left until the Democratic Primary on September 14th, our dedicated volunteers have reached out to over 3,000 voters at their doors! 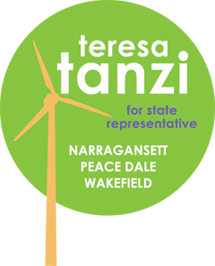 By getting the message out across the district, talking with voters about their ideas and what they want to see in their state government, the Tanzi campaign continues to gain momentum and support!